OMG Posters! » Archive "It's Mourning In America" Art Print by Shepard Fairey (Onsale Info) - OMG Posters! 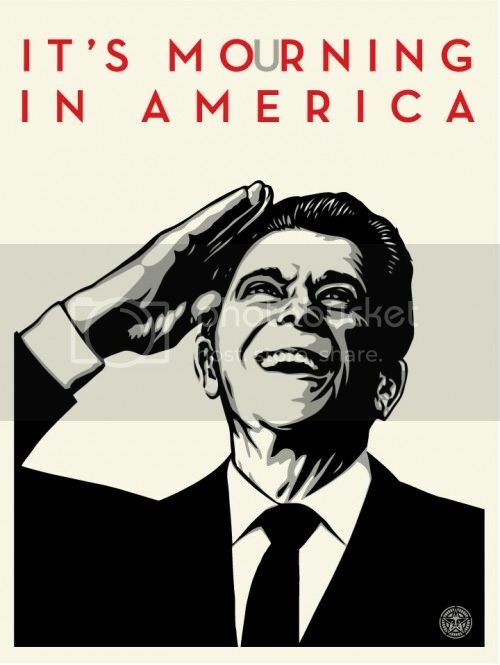 Shepard Fairey will release the second print in his Reagan series later today. “It’s Mourning In America” is an 18″ x 24″ screenprint, has an edition of 450, and will cost $55. A portion of the proceeds will benefit a campaign finance reform organization. It goes up today (Tuesday, May 31st) at a random time. Visit ObeyGiant.com. Not a kid anymore, a man. I also back him up; just don’t wanna buy all his prints cause they have Obey logo. Ok- goodbye. Support the youth instead kid. Man, Shep catches a lot of flack considering every single print run is selling out, so somebody is obviously excited to buy them. You can’t bag on a guy for playing to his crowd. @Mike His prints are cheap considering his relevant notoriety but its an edition of 500 so when you compare to most smaller artist’s editions which generally don’t brake one hundred, he is in a completely different market. He isn’t selling to print enthusiasts as much as equity collectors…but with an edition of 500 you might as well do 1000 and have Target™ start hocking them. When he does do smaller runs the price tends to shoot through the roof. Its all subjective and there is no argument that he his riding this street art wave all the way to the bank, but who wouldn’t if they had the opportunity? And this one, technically speaking, is much stronger than the last one.